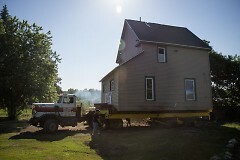 For SiTE:LAB, a Grand Rapids-based arts non-profit, and Julie Schenkelberg, a Brooklyn- and Grand Rapids-based artist, “moving house” recently meant raising a house on Franklin Street SW off its foundation, rotating it and moving across the lot it to a new location on Rumsey Street SW in preparation for Schenkelberg’s project at SiTE:LAB for ArtPrize 2016. One of ten vacant structures loaned to SiTE:LAB by Habitat for Humanity of Kent County, the house is slated for demolition in 2017 when Habitat begins a major neighborhood redevelopment project. With the house now in its new position on SiTE:LAB’s Rumsey Street Project site after the move in June, Schenkelberg intends to use the house as the basis for a freestanding sculpture by cutting, piercing and carving the structure over the next four months. Transmigration represents Schenkelberg’s largest-scale work to date, work that involves the collective, collaborative effort of many. 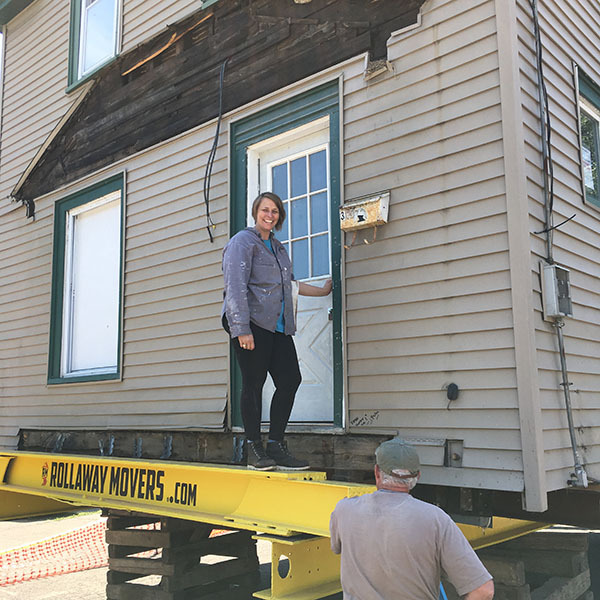 Rollaway Movers, a Grand Rapids-based company that’s been moving houses for over 60 years handled the actual move. 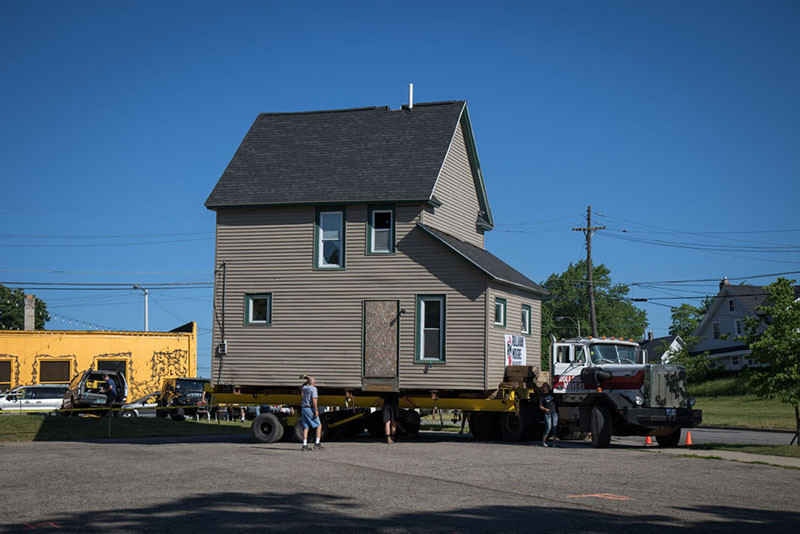 Schenkelberg and SiTE:LAB worked together coordinating details with the City of Grand Rapids and Habitat for Humanity to acquire the necessary permits prior to the move. Documenting the house move in photos and video even became a group endeavor with SiTE:LAB, Stephen Mallon, and Sidecar Studios working together to cover all the angles. The GRCC Photography Program provided support and camera equipment for the documentation. Schenkelberg will have two interns assisting her with the project, one from the University of Akron and one from the Rhode Island School of Design. Both undergraduate students will spend a few weeks each working with Schenkelberg to realize her vision for the house. Her ArtPrize 2016 project will be Schenkelberg’s fourth piece exhibited with SiTE:LAB. Schenkelberg has twice participated in SiTE:LAB’s ArtPrize exhibitions, including her 2014 piece Symptomatic Constant, winner of the 2014 juried award for best installation. Schenkelberg also exhibited with SiTE:LAB at 2015’s Untitled exhibition at Art Basel Miami. In addition to her exhibitions with SiTE:LAB, Schenkelberg’s recent 2015-2016 exhibitions include Color of Temperance: Embodied Energy at the Mattress Factory, and Swan Song at the Asya Geisberg Gallery in Chelsea, as well as a residency at the University of Akron.